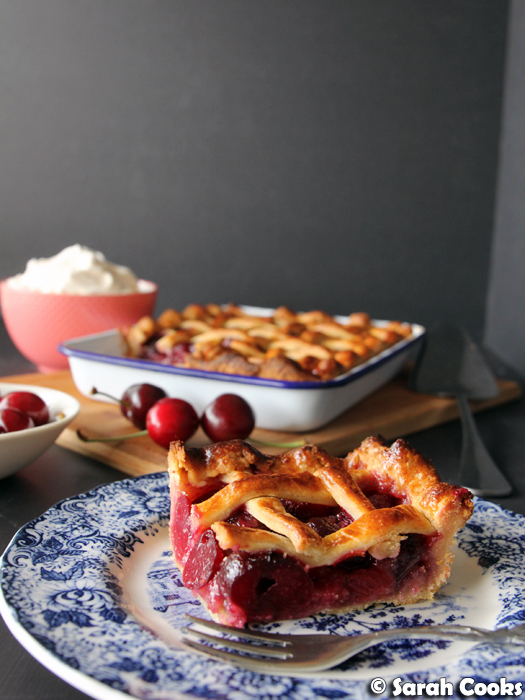 Cherry Slab Pie. 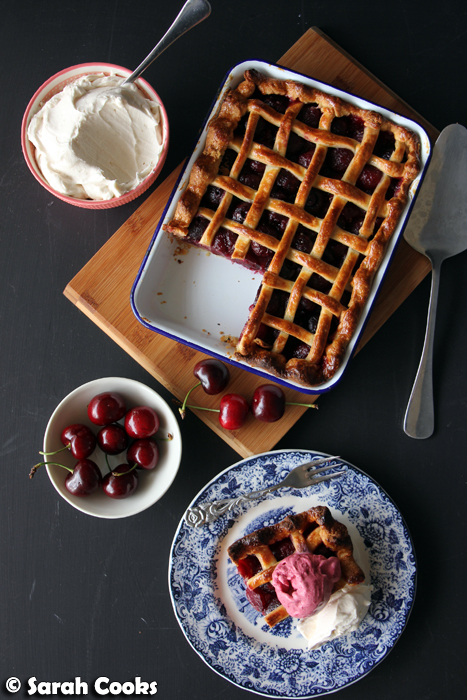 Fresh juicy cherries are encased in a flaky buttermilk pastry, and baked in a big slab for easy serving. 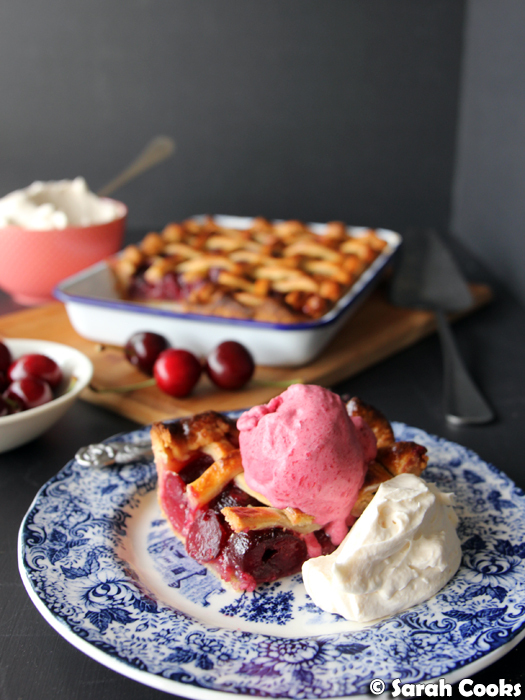 It's a simple but perfect combination, and a fabulous way to enjoy cherries when they're at their peak. 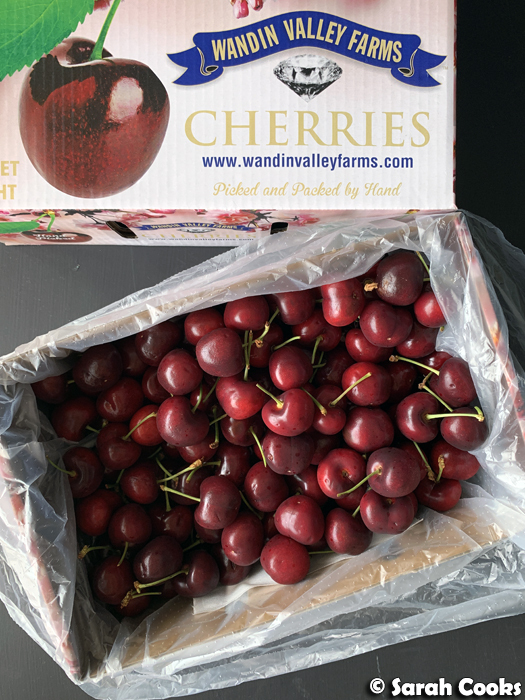 Five short days ago, I received a very exciting parcel - some beautiful, enormous, perfect cherries, fresh from Wandin Valley Farms. I'm obviously a huge lover of cherries (see my Black Forest Cake, Black Forest Cupcakes, and Cherry Pie), and you may remember my trip to CherryHill Orchards last year. Well, the cherry season has started again, and it looks like promotional activities are in full swing. This year, unfortunately I've been too busy to make it out to any of the farms (boooo) and I've had to decline a few invites, but the Victorian Cherry Association (i.e. Vikki Leng) kindly sent me a gift box of cherries. And when I say "gift box", I actually mean FOUR KILOS! Holy moly! With my wife out of town, and with me about to go overseas as well, I knew I had to get through those cherries, and quick! I was determined that they wouldn't go to waste! I, of course, ate them by the handful, I shared some with some colleagues who I knew would appreciate them, and I packed some up and gave them to my brother's girlfriend as part of her Christmas gift. (I was going to give my parents some but they'd already bought themselves a big box of cherries, whoops). And, of course, I baked. The weekend after I got them I actually went a bit cherry crazy - I made Bravetart's roasted cherry ice-cream, I made her cherry-pit whipped cream, and of course, I made this pie. I had grand plans to make some cherry jam as well, but after all that baking and churning and whipping and pitting and cleaning (oh God, the cleaning), I just couldn't face another dish. So, the remaining cherries are all cleaned and pitted and carefully stored in the freezer for future use. Let's talk about this pie! Slab pie seems to be an American invention, and is basically just a regular pie made in a rectangular shallow baking dish. It looks festive and is easy to cut and share. 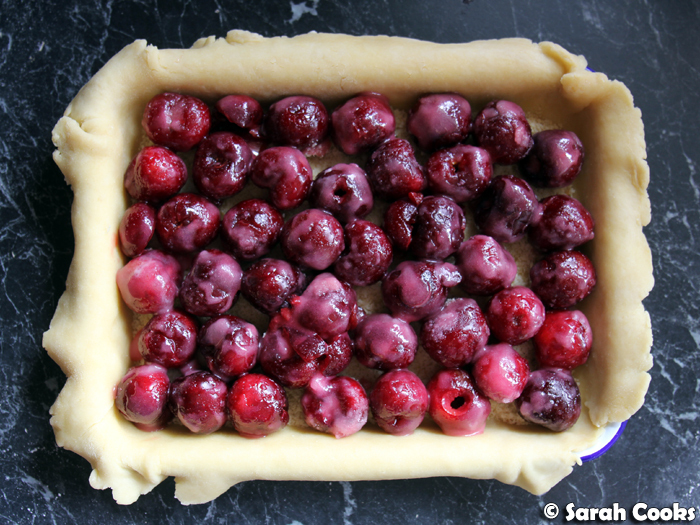 I thought it would be fun to try a new pie shape with these gorgeous cherries! For my first foray into the slab-pie world, I kept it nice and simple. I used my current favourite pie crust (Joy the Baker's buttermilk pie crust), and filled it with a mixture of the fresh pitted cherries, some sugar, some tapioca starch, a pinch of salt, and a little lemon juice. (I actually had just the right amount of pie dough in my freezer, leftover from the cardamom pumpkin tahini pie - thank-you Sarah from the past!) I know Joy refers to this pie crust as her "all butter pie crust", but for me, the defining feature is the inclusion of buttermilk, which adds a lovely tang and keeps the pastry tender. As always, I like to sprinkle a layer of almond meal on the base of the pie, to avoid the dreaded soggy bottom. (I think actually, with the heat-conducting metal baking dish and the tapioca in the filling, you're unlikely to get a soggy bottom anyway, but better to be safe than sorry). Cherries really mean Christmas here in Australia, and I thought they looked lovely and festive with their (unseasonal) dusting of tapioca starch and sugar "snow". At first it looks like the mixture will be super dry, with huge pockets of tapioca everywhere, but be patient and keep gently stirring, until some liquid is released from the cherries and it looks something like this. Another hot tip: don't fill the pie too much. A few little gaps are fine (necessary, even), and you don't want it to overflow. 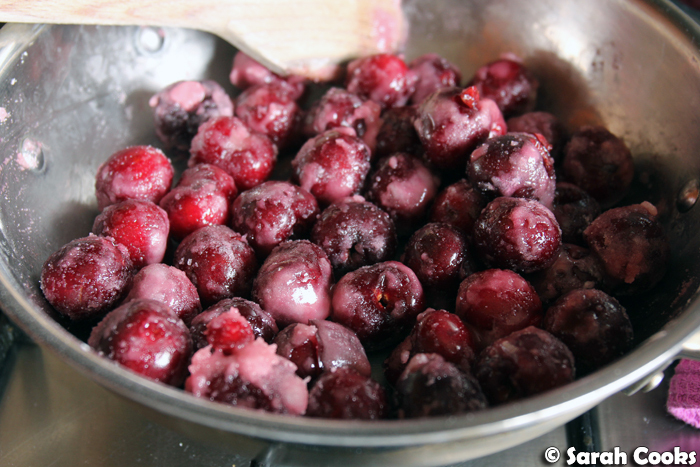 As the pie bakes, the filling expands - liquid from the cherries is released and mixes with the tapioca / sugar mixture, and fills in the gaps. So, lattice! 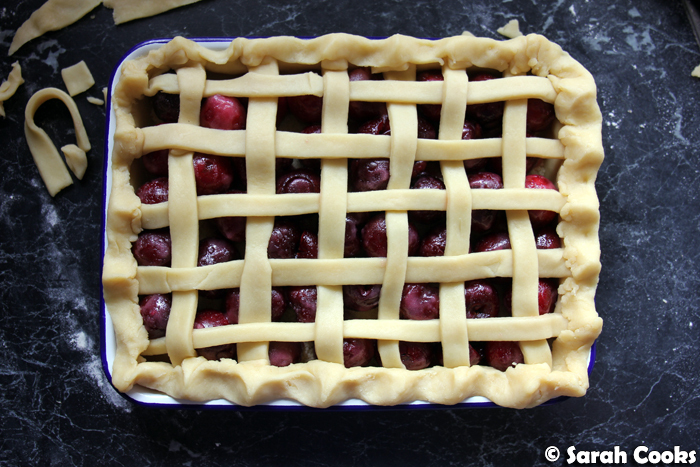 Fancy lattice-topped pies are all the rage on Instagram and Pinterest, but I've never done much lattice work (except for when I was about eight, and my Mum and I made a basket out of bread dough for some reason). I am usually all about the double crust! However, you need to leave holes for steam to vent, so I thought I may as well try a basic lattice. It was actually easier than I thought! It helped that the pastry was so pliable as well. (The extra-rich shortcrust I use for my usual round cherry pie would be far too crumbly). I'm glad I gave it a go. I see that the pastry strips weren't completely even, and that the edges weren't perfectly or evenly crimped, but once glazed and then baked it actually looked quite smart. After baking, you have to let it cool down quite a bit, so that the liquidy filling sets and becomes sliceable. 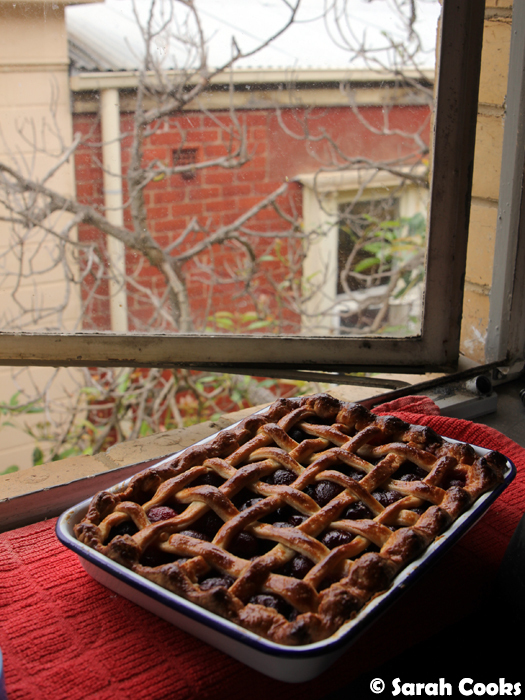 I legit let my cherry pie cool on the windowsill, and felt like I was in an old timey-cartoon. Now, the accompaniments. I chose to double down on the cherry theme (or is it triple down? ), with cherry ice-cream and cherry pit whipped cream. 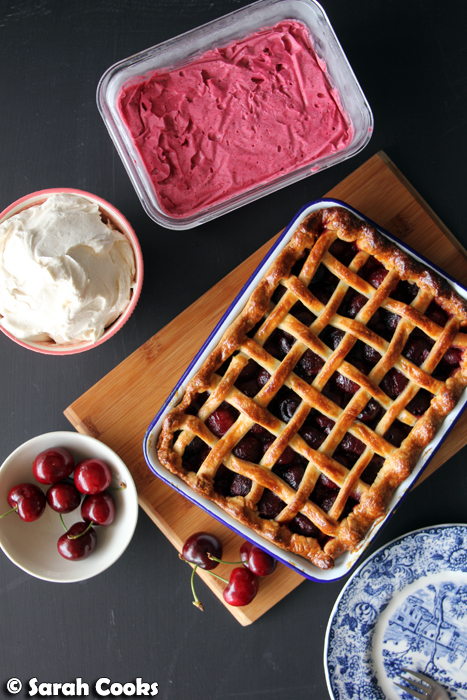 You definitely don't need to do this (but if we're talking "need", no-one really "needs" to bake a cherry pie) - the pie is lovely by itself, or would be great with regular whipped cream, or à la mode with vanilla ice-cream. However, I am currently totally obsessed with Bravetart / Stella Parks' amazing recipes, and need only the flimsiest excuse to try out a new one. 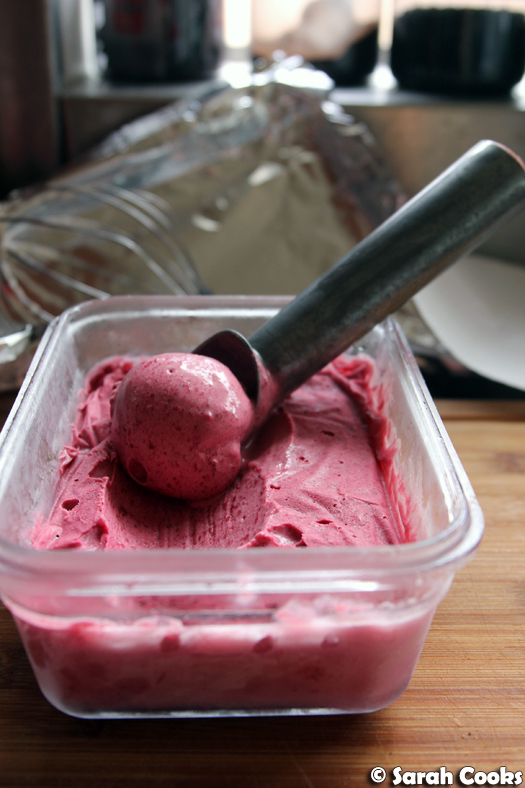 Making cherry ice-cream is a bit of work (slightly greater than the pie itself), but the cherry pit whipped cream is super easy. 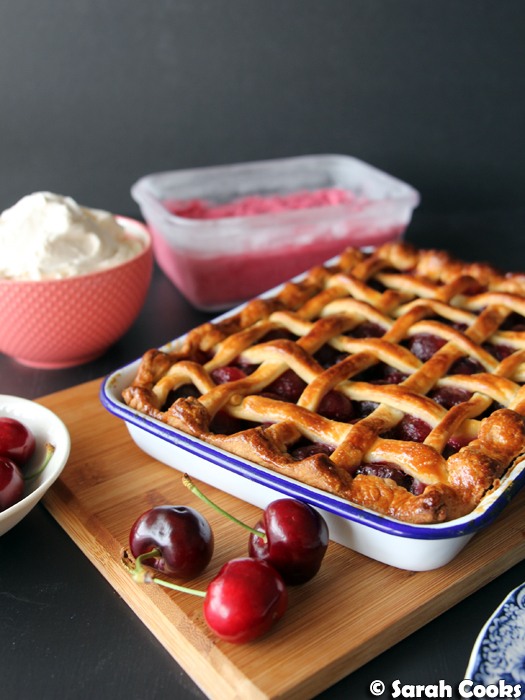 If you're already pitting cherries for the filling, and are planning on whipping cream to serve with the pie, it's not that much extra effort to steep the pits in cold cream for a few hours, and then strain and whip the cream with some sugar. The cherry pit whipped cream has a pale pink colour, subtle cherry flavour and is quite fluffy and stable. The ice-cream, on the other hand, is bright pink! Gosh I love it so. Back to the pie! With our without accompaniments, it was pretty damn great. 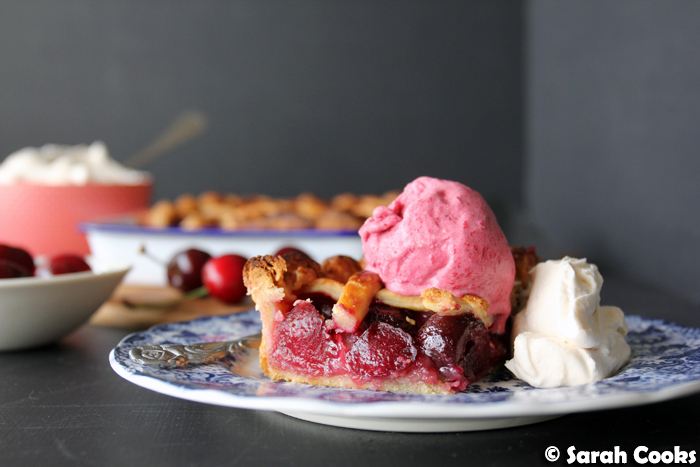 The sweet-sour cherries, the crisp buttery pastry crust, shattering as you bite into it - heaven! What a way to showcase those fabulous cherries! I definitely recommend baking it in a metal tray, rather than a ceramic one, for better heat conduction and to ensure a crisp base. (This enamel baking dish I used is made of porcelain fused onto heavy-gauge steel so it looks ceramic, but also conducts heat really well). I loved how pretty and rustic it was. To me it looked like everything you'd think of when you think of pie. (I often think of pie). Dessert! Afternoon tea! General snacking! Dare I say... a holiday breakfast? Do you enjoy a bit of lattice work? What other fillings do you think would do well with the slab pie treatment? To make the buttermilk pie crust, place the flour, sugar and salt in a bowl and whisk to combine. Chop or grate the cold butter into small pieces. Add to the flour and rub in with your fingertips until the mixture resembles damp sand and the butter is evenly distributed. Make a well in the centre and pour in the 1/4 cup buttermilk, stirring with a fork to combine. Once it comes together in a shaggy dough, knead together, then divide into two pieces, one slightly larger than the other. Form into two squat disc. Wrap with clingfilm and refrigerate for one hour (or longer). To make the filling, de-stem and wash the cherries. 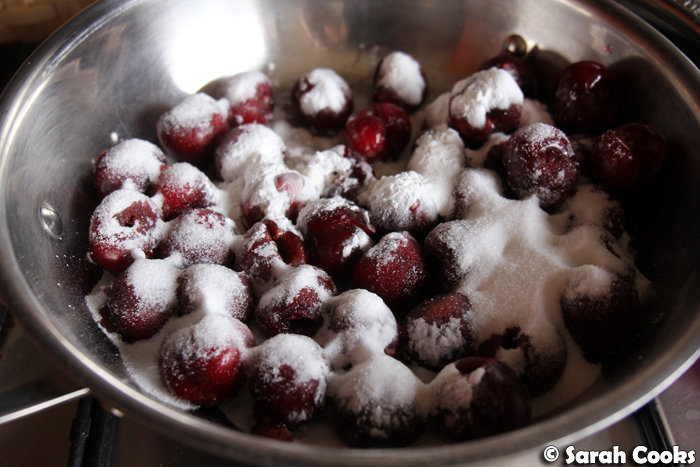 Pit the cherries and place in a large mixing bowl. Spoon over the caster sugar, tapioca starch, salt and lemon juice. Gently stir to combine. (The fruit will continue to release liquid as it sits, so don't worry if it seems dry and grainy to begin with). To assemble and bake the pie, preheat the oven to 190C. On a lightly floured surface, roll the larger ball of dough out into a 5mm thick rough rectangle. Lift the dough off the bench between rolls to make sure it doesn't stick to the bench. Gently ease the pastry to line a 24x18x3cm rectangular enamel baking dish. Trim the edges to 1-cm higher than the tin. 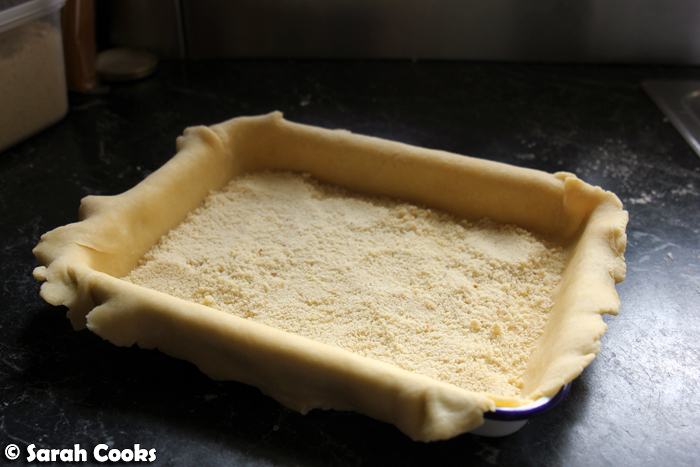 Roll the smaller piece of dough into a 5mm thick rectangle, approximately the same size as the baking dish. Cut into 1-cm strips and set aside. Sprinkle the almond meal evenly over the base of the pie. Tumble in the cherry mixture. Don't overfill the pie, as the filling will expand as it cooks in the oven. It's ok to leave a few gaps. 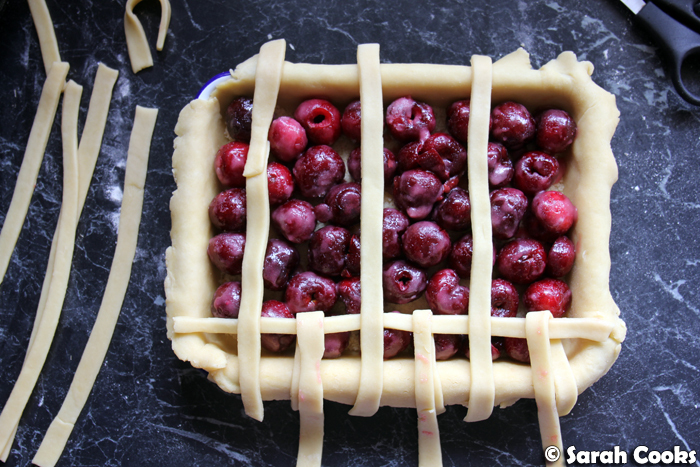 Take half the pastry strips and arrange horizontally on top of the pie, spacing them evenly. Arrange the remaining pastry strips vertically on the pie, weaving them over and under the horizontal stripes. Push the edges down into the border, and snip off any overhang from the strips. 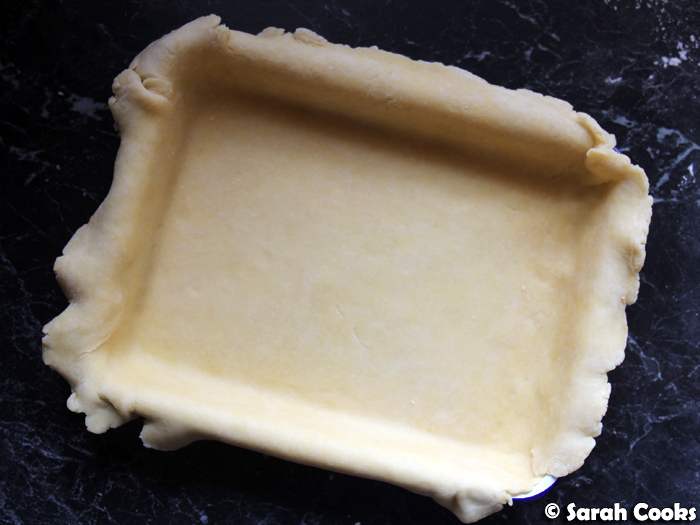 Fold the pastry border over and press down gently to seal. Pinch or crimp any which way you like. 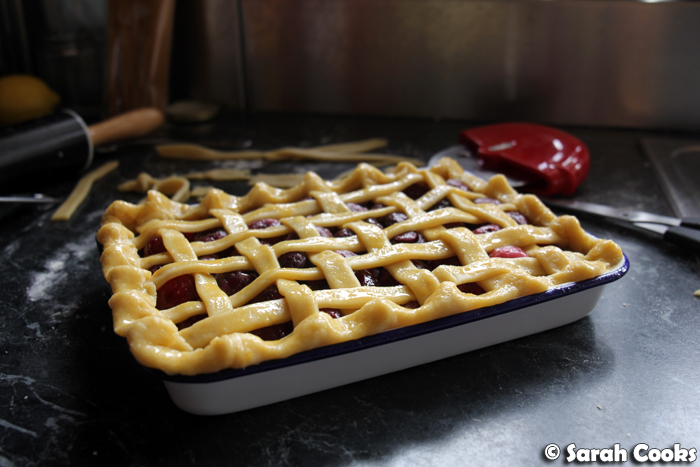 Place the assembled pie on a baking tray (to catch any sticky drips), and bake for 45 minutes, or until the pastry is cooked through and the filling is bubbling. I'd suggest covering the pie with foil after the first 20 minutes to stop it from browning too much. Remove the pie from the oven and allow to cool for at least an hour to allow the filling to set. Cut into slabs to serve, and serve with whipped cream and / or ice-cream. (I would highly, highly suggest making Stella Parks' cherry pit whipped cream, and if you really want to gild the lily, her roasted cherry ice-cream too). Sarah received complimentary cherries from the Victorian Cherry Association. I just made a pie today! I'm crazy for all the fruit at the moment (I only seem to eat fruit in pies or cakes hehe).